Whether their taste is for carp into the mid 20's of for double figure bags of roach, bits and skimmers, 10 acre Lodge Lake is a firm favourite with many. Crusians, tench and perch, the association records crusian is from Lodge. Fishing from more than 40 permanent pegs only, depths vary from 2 to 18 feet and most baits works at sometime of the year. Don't ignore the little pond where the brook comes in under the H5. It is up to 10 feet deep, holds stacks of fish. 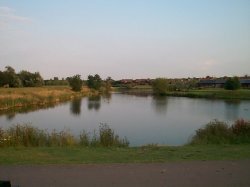 Thanks to a small minority of individuals, MKAA have had to ban night fishing on Lodge Lake for everyone other than members of a new to be formed night syndicate. 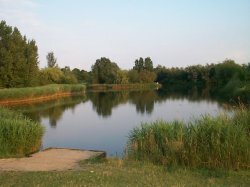 Individuals using the shrubbery around the lake as toilets have brought this ban into being and any such behaviour on other waters will if not stopped, result in a loss of fishing. Please, if you value your fishing , help the Association stamp out such anti social behaviour by reporting the culprits to MKAA. If planning a long session please make portable provisions. 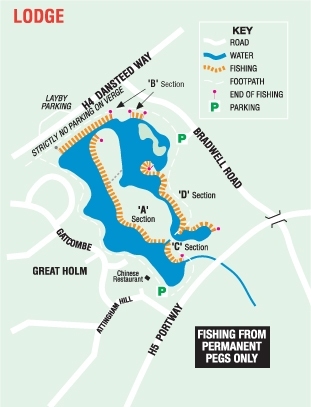 Members will be expected to bailiff Lodge Lake on a rotation basis at night throughout the year (not just during the summer months) even if not fishing. Fishing for night syndicate members only between dusk and dawn, no guest tickets permitted. Syndicate members must honour any MKAA prebooked matches and be off the water by midnight before any arranged matches. All other MKAA rules apply. It will be up to the MKAA Executive along with some input from the bailiffs on selecting the syndicate members no correspondance will be entered into and the executive decision is final. We apologise to MKAA members that we have had to take this course of action but it is either a night syndicate that we make work or no night fishing at all on Lodge. The new list of applicants will superceed any previous list as applicants had not been aware of the rerquirements, if you have already submitted your name please do so again to the email address above.